Since minimally invasive surgery (MIS) was applied to gastric cancer surgery, it already became one of the standard treatment modality for gastric cancer. The role of MIS for treatment for gastric cancer is expected to be increased. 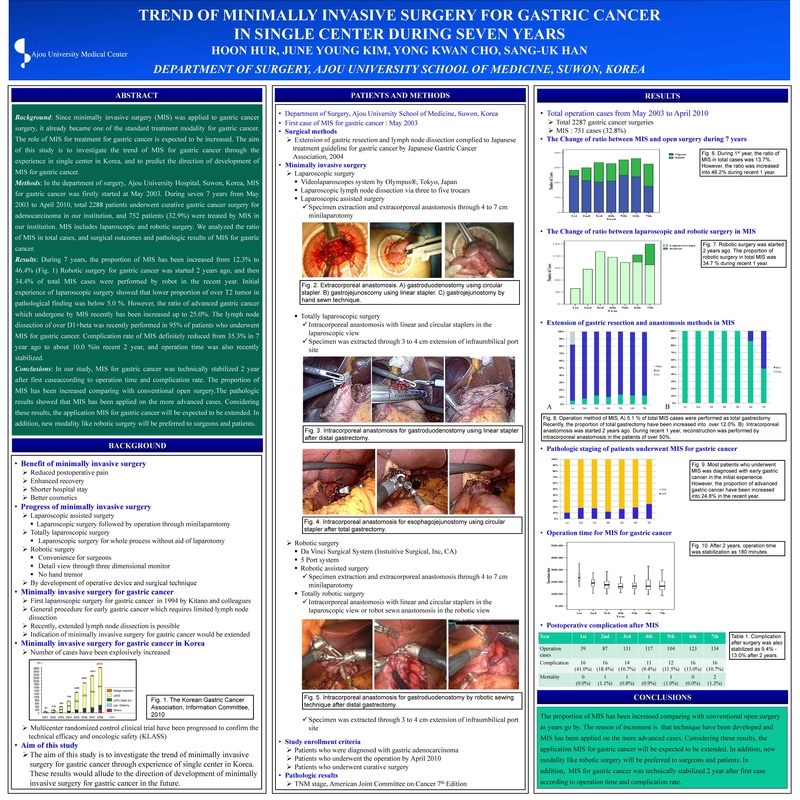 The aim of this study is to investigate the trend of MIS for gastric cancer through the experience in single high volume center in Korea, and to predict the direction of development of MIS. For the first time, MIS was performed in department of surgery, Ajou University Hospital May 2003. During seven 7 years from May 2003 to April 2010, total 2288 patients underwent curative gastric cancer surgery for adenocarcinoma, and 752 patients (32.9%) were treated by MIS in our institution. MIS includes laparoscopic and robotic surgery. We analyzed the ratio of MIS in total cases, and surgical outcomes and pathologic results of MIS for gastric cancer. During 7 years, the ratio of MIS has been increased from 12.3% to 46.4% (Fig. 1) Robotic surgery for gastric cancer was started 2 years ago, and then 34.4% of total MIS cases were performed by robot in the recent year. Initial experience of laparoscopic surgery showed that lower proportion of over T2 tumor in pathologic finding (below 5 %). However, the ratio of advanced gastric cancer which underwent by MIS recently has been increased up to 25.0%. The lymph node dissection of over D1+beta was recently performed in 95% of patients who underwent MIS for gastric cancer. Complication rate of MIS definitely reduced from 35.3% in 7 year ago to about 10.0 % since 2 year after initial MIS case, and operation time was also stabilized. In our study, MIS for gastric cancer was technically stabilized 2 year after first case according to operation time and complication rate. The proportion of MIS has been increased comparing with conventional open surgery. The pathologic results showed that MIS has been applied on the more advanced cases. Considering these results, the application MIS for gastric cancer will be expected to be extended. In addition, new modality like robotic surgery will be preferred to surgeons and patients.